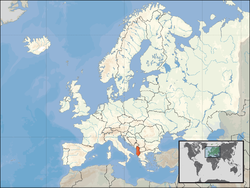 Des ke motto: "Albanians place their faith in Albania"
Albania, Southeastern Europe ke ek des hae. Iske capital city Tirana hae aur lag bhag 3.6 million log Albania me rahe hae. Albania ke bagal me Kosovo, Montenegro, Greece aur Macedonia hae. Iske coast It has a coast Adriatic Sea se west me aur Ionian Sea southwest me hae. Albania ke official bhasa Albanian bhasa aur national anthem Hymni i Flamurit hae. Ii panna ke 28 July 2018, ke 18:53 baje, pichhla time badla gais rahaa.